Visit Bestagno during your stay in Liguria, Italy. Castello di Bestagno: Of this building only a few ruins and a tower still remain today. This facility was used in the past to ensure better control of the surrounding regions. Cappella Natta, a little country church in Byzantine style on the road to Pontedassio. Bestagno was, during the era of medieval renaissance, an important position for control of the surrounding area by the rulers of the time, due to its isolated location and good view over the valley. 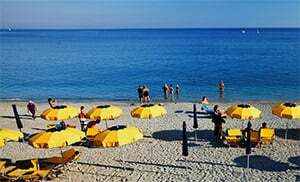 It is for the same reason that the territory there, together with those of Oneglia and other neighboring towns which lie in the far west of Liguria, was often attacked by the surrounding powers. Those included among others the republic of Genoa, the Marquis of Monferrato, the kingdom of Savoyen and neighboring France. Bestagno was until 1928 an independent municipality and was then incorporated into the municipality of Pontedassio. Bestagno is a hamlet belonging to the municipality of Pontedassio in the province of Imperia. It is located on the hills of the Impero valley and is surrounded by olive trees which are planted here in terraces and are well cared for. One can reach Bestagno from Imperia through the SS28 by crossing the Impero River in Pontedassio.